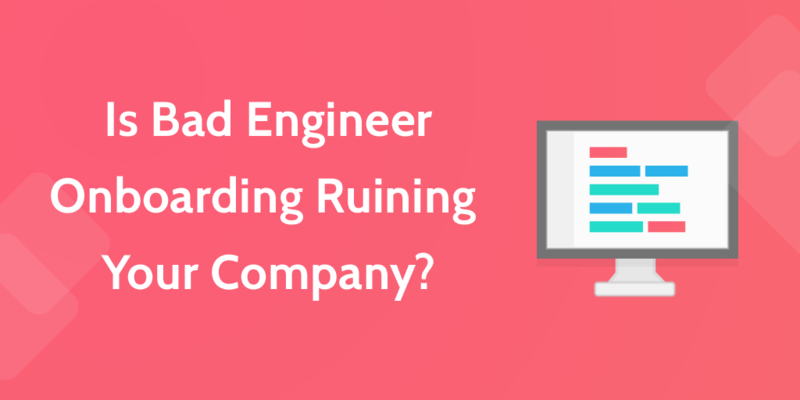 Is Bad Engineer Onboarding Ruining Your Company? The following post is a guest contribution from Steve Klein the co-founder of StatusPage.io. How long does engineer onboarding last at your company? 1 week? 2 weeks? A couple months? Regardless, it’s a process you think about in the short term, right when a new employee starts. Once it’s done, it’s done, and you can go on to thinking about the million other things that are going on in your company. Right? The effects of employee onboarding last way beyond when a new person starts working and impact your whole company. If your onboarding isn’t effective, in just 1 or 2 generations of hiring you’re dealing with a team that’s shockingly less productive than it could be — and costing you a lot of money. At StatusPage, we’re learning from companies that have been through a couple generations of onboarding to find the processes that work best. We put a lot of effort into finding great team members and want to make sure they can reach their full potential. Every round of hiring without good onboarding leads to a huge loss of productivity, so it’s important to get it right as soon as possible. We need to put great processes in place to make sure people learn the technical skills they need, and make sure new hires understand our values and how we work so they can excel. It’s a lot of work, but the payoff is absolutely worth it. Because if bad onboarding can hurt your company, in the long run, good onboarding practices can create positive effects that last just as long. Some back of the napkin math can show how developer onboarding affects companies in the long term. Assume we’re starting a company with one technical founder. That technical founder is going to hire a small round of core engineers who are going to lay down the foundation for your company. That first round of engineers will eventually become managers, and train a second, larger round of engineers. In a year or two, those engineers will follow the same path, training an even larger group of third generation engineers. All of this will play out over about 4-5 years. Next, we’ll imagine 3 different scenarios. In the first, the company puts tremendous time and effort into onboarding, and their process is basically perfect. In the second, their process is good, but they overlook some important things, so it’s only 95% as effective. And in the third scenario, a company has some pretty big gaps in their onboarding, and it’s only about 80% as effective as it should be. Now that we have those assumptions out of the way, look the first 3 iterations of hiring. You can see the difference from the first round of hiring, but it really becomes clear as the company hires progressively larger cohorts. After 3 rounds of hiring at 95% effective onboarding, the company’s employees are operating at about 87% of their potential. The office has 39 people, but it’s like they’re operating with only 34. Even with a very good onboarding process, they’re essentially paying for the work of 5 people and getting nothing for it. In the second round, when the company hires 9 new engineers, they end up being only as effective as about 6 people. After 3 rounds of hiring at 80% effective onboarding, the company is only 56% effective as it should be. That’s like trying to run a 40 person office with only 22 people! Think about what that would mean for your bottom line if this was your company. You’re paying those 39 engineers competitive, six-figure salaries, and you’re getting just a little over 50% of their best possible work. When your company hits 39 employees, that means you’re costing yourself almost $2 million in lost potential. 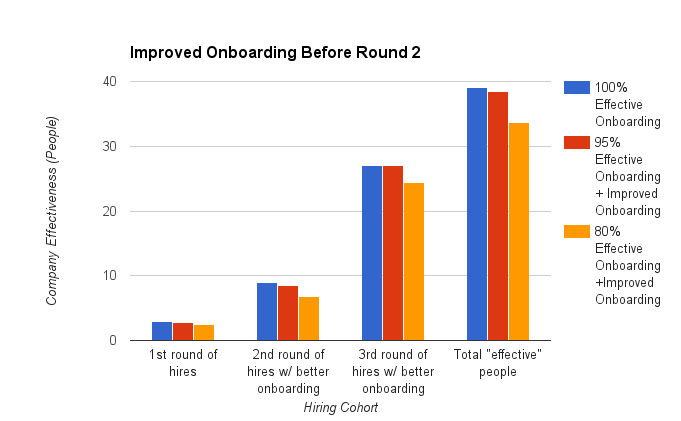 We can also look at this graphically to help visualize the effects of bad onboarding for the first 3 hiring cohorts. Poor onboarding creates problems that build on each other and get progressively worse, to the point where a company is getting weaker and weaker and wasting huge sums of money, just when it should be really accelerating its growth. Why Does Bad Onboarding Compound? Ok, you’re saying. That looks bad, but it’s just a hypothetical. *My *onboarding process won’t follow this trajectory, even if it’s not as good as it should be. Right? It’s true that this is a simplified scenario, not real life. People grow and learn in their jobs beyond initial onboarding. But there’s a lot of truth to it. It’s easy to see why that’s the case if you think about the two parts to onboarding—your process, and the people doing the training. Think about the 80% effective onboarding scenario. The founder onboards the first few engineers with just an ad hoc, sink-or-swim process, and no particular guidance—and they only become 80% as effective as they could have been with a better onboarding process. In turn, those engineers onboard the next generation with same vague processes. The 2nd round of engineers become only 64% (.8 * .8) as effective as they could have been. Because you have poorly-trained people implementing poor processes, the problems from bad onboarding get worse over time. These problems aren’t abstract. Bad onboarding processes reduce your new employee’s technical abilities and normalize bad habits in clear-cut ways. There’s a lot of work that goes into onboarding developers. Every company has its own unique codebase, tools that a new engineer might be unfamiliar with, and dependencies they need to learn. There’s a lot of pressure to start producing quickly, but this can cause companies to take shortcuts and skip activities that can give new engineers an in-depth understanding of how the code really works. Once a new employee is doing regular work—debugging code, running tests, taking on projects—it might seem like they’re fully up to speed. But that’s not the case. Without good onboarding, each generation of engineers will have slightly larger gaps in their knowledge. While they might be able to handle everyday tasks and problems, it will take longer to solve really big problems, or to make really substantial changes to the product. Senior engineers are going to take on more importance, and later hires are going to struggle to grow into leadership roles. Your company is going to grow larger, but not more effective. A new employee is going to learn a lot about your company’s culture in the first few weeks after they start, and will build habits that are hard to shake. You want to make your values totally clear or bad habits will take over. That’s because of “normalization of deviance,” a phenomenon where bad behaviors left unchecked get repeated over and over until they become normal. At that point, they’re no longer recognized as bad behavior, even though anyone who came in from the outside would recognize them as such. It’s a problem that’s been observed in everything from plane crashes to cybersecurity breaches, and though the results might not be as immediately serious for your company as a plane crash, there is a real cost when people waste time pursuing low priority tasks or keep calling meetings without a firm agenda that don’t accomplish much and throw off everyone’s focus. When bad processes become normalized, new people don’t become independent but continue to rely on the people who came before them. When those people need to take on increasing responsibilities, it’s going to cause burnout. Most of the lost effectiveness that comes from bad onboarding happens from the loss of technical knowledge and the proliferation of bad habits. But there’s one other major way that bad onboarding can cripple your company. As much as a third of employee turnover happens within the first 6 months of joining a company. A 2014 survey by BambooHR found that the most frequently cited reasons were a lack of clear guidelines and training, and struggling to feel like part of the team. These are exactly the sort of problems good onboarding can address, and which most often get overlooked in bad onboarding. Odds are, you’ll lose some of your best employees this way because they’ll be able to pursue other opportunities, and the rest of your team will have to work even harder to pick up the slack. It’s a huge loss in time and resources, and incredibly demoralizing. The damage from bad onboarding can linger, so the sooner you start implementing good onboarding, the better it is for your company. Take another look at the chart and see what happens when you start improving onboarding pretty early in your hiring process. Let’s say the first round of people who were hired by your company’s founder radically improve the onboarding process starting with the 2nd round of hires. If onboarding was 95% effective, now it’s basically 100% effective. If their process was only 80% effective, it’s improved to 95% percent. In the 2nd round new engineers become 76% effective (.8*.95). 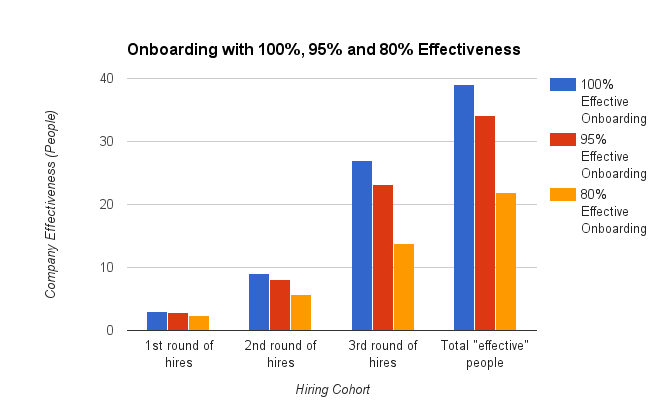 The next round of hires benefit from the full effects of the new onboarding process and become 90% effective (.95*.95). The difference is immediate, but it becomes really apparent after one more round. If your company started out with 80% effective onboarding and improved onboarding for the 2nd round of hires, then after 3 rounds your company will be 86% effective. That’s a 30% bump in effectiveness from better onboarding that translates into a huge increase in productivity and in your return on the investment in your employees. When we look at this graphically, the results are even more apparent. Put a good onboarding process in place and your team is going to stop problems from building up with your very next round of new hires. A few rounds of hiring later, and you’re basically going to be near 100%. Lots of companies already recognize the value from onboarding employees, and that means there are plenty of examples of good practices that are important for avoiding problems that build across iterations of hiring. When you’re designing a technical ramp up for new engineers, you need to set clear goals and assign someone to see they’re being met. Make sure new hires are learning effectively by assigning a mentor to be a directly responsible individual (DRI) in charge of making sure new hires learn all the skills they need. Set a timeline with goals at certain key points, for instance at 30, 60, and 90 days to ensure new hires are on track. Process Street is a powerful tool to help teams create, systematize, and collaborate on checklists and procedures, to ensure everyone’s on the same page about helping a new engineer meet their goals. Create an employee onboarding checklist to track and rationalize the process. Use onboarding to really drive home your culture and values will prevent the normalization of deviance. Create a “day one document” that lays out everything about a company’s workflow, habits, and values. Drive home how important certain processes are by doing them more frequently during onboarding. At Wistia, formal feedback is a major part of the company culture. Long term employees do formal feedback annually, but for new hires, there’s formal feedback at 30, 60, 90 days, 6 months, and one year in. Finally, bring a personal touch to onboarding to make new employees feel like part of the team and eliminate one of the biggest sources of potential attrition. Introducing everyone to a new hire on the first day, taking them out to dinner with the team or even having them send out an email introduction to the whole office are ways to help them feel like your company is a place they can see themselves long term. Good onboarding won’t help your previous rounds of hires, but it will pay immediate dividends for new rounds of hires and put an end to compounding problems. A lot of companies neglect onboarding not because it doesn’t seem important, but just because there’s too much else going on. When you are thinking about nailing a funding round, or a major new feature launch, or you’re trying to reduce user churn, there are always more things that seem to need pressing attention. But onboarding needs to be an absolute priority. The difference between good onboarding and bad onboarding is the difference between a team that’s performing at its full potential, and a team running radically below it and costing you a ton of money in the process. Luckily, even though the effects of onboarding are huge, it only takes a modest investment to set up good onboarding. You have a wealth of institutional knowledge and talented people who can share it. Making that knowledge easy to find, sharing it earlier, and nailing down clear priorities for what you expect to get out of onboarding will all make a huge difference without a huge effort. Most companies start later than they should, but whenever you do, you’re going to start seeing a benefit.The best time to start onboarding was yesterday. The next best time is right now.